Performing Arts and Workshop Studios (PAWS) in collaboration with The Knot Centre presents their new stage drama/musical, ‘Rubiewe’. Playing on May 27 at The Knot Centre, Yaba at 4pm, and with two showings on May 29 at 3pm and 6pm at the Agip Recital Hall, MUSON Centre, Lagos, the play promises a great time at the theatre. ‘Rubiewe’ is an African adaptation of the classic fairytale, ‘Beauty and the Beast’. The story of love that goes beyond the physical has always been ripe for cross-cultural adaptation, and fast-rising stage director Kenneth Uphoho is set to deliver the African version. “I have always been fascinated by this story and having the opportunity to direct it in our own way makes it even more exciting. It will definitely be a thrilling experience for everyone who comes out to watch,” said Uphoho. 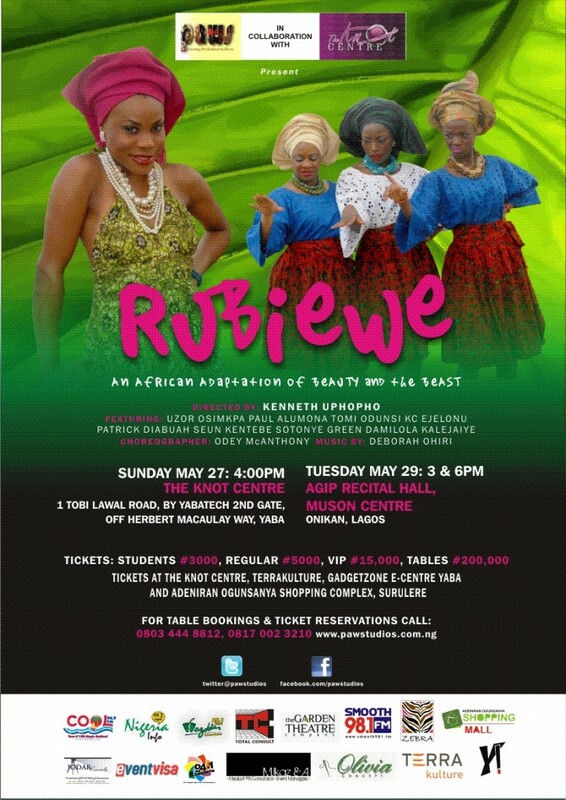 Rubiewe is to be staged on May 27 and May 29 with multiple performances in Lagos. The talented cast includes: Uzor Osimkpa, Tomi Odunsi, Damilola Kalejaiye, Paul Alumona, Sotonye Green, and KC Ejelonu. The music is directed by Deborah Ohiri and choreography by Okey McAnthony. Singing sensation, Evaezi, is the introductory act for the play on May 29. Tickets to the play go for N3000 (students), N5000 (regular), N15,000 (VIP) and N200,000 (table). Visit www.pawstudios.com.ng for more information.